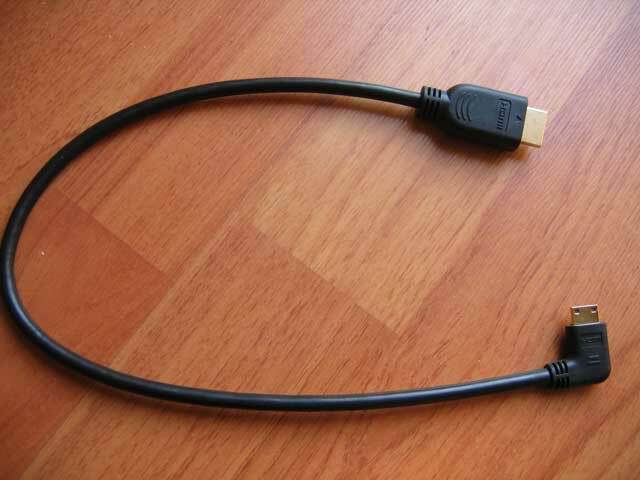 Very good, short, angled miniHDMI to HDMI cable. I bought a couple of these a while back. they work very nicely and are of good quality. I agree. I also have them. Just to confirm that the HDMI to composite converter, from the company C & E, model HD-Video Converter-T24A works as expected with GH2 mini HDMI output. It comes with S-Video and three RCA outputs (audio and video). It has Automatic dictation of Pal & NTSC signal. It works in playback and recording mode. I'm using with a VeriZoom TFT 7" monitor. Guys, keep this out of this topic. use proper one. Does the angle of it impede with the mic/remote jack? In other words does it orient downward or upward? Please, guys, lets move this to another place. I did the mistake to start the topic in the wrong place. Apology for the inconvenient to all. I wanted to ask, if your camera GH2 work PAL or NTSC system? because when I turned on my camera GH2 PAL system I do not view the HDMI converter. I can not find the problem. I recently bought this cable http://www.alzovideo.com/alzo-dslr-rig-accessory-hdmi-audio-cord-set.htm for my GH2. They come in two varieties. The red cable will make the cable direction go down and the white cable(which I got) sends the cable up . It's not super flexible, but probably twice as flexible as the regular short HDMI cables that I previously bought on Ebay.